In ancient times, the Gods challenged the Well of Wisdom... Is YOUR Writing competitive? Odin's Chapbook Competition. Perhaps you'll be crowned the 'bringer of victory'? Do you believe in your muse and think you’ve got what it takes to beat Odin, the god of poetry and wisdom, in a battle of expression? Perhaps you’ll rise up, drink from the Well of Wisdom and be crowned the ‘bringer of victory’? Why not let your imagination soar and enter ‘Odin’s Opposition’ today for free. The battle has already begun! Pass through the great gate of clouds and step into the peak of the many ridged Mt. Olympus. Will you feel impelled to climb it, and lead your Muse to victory? There’s only one way to find out! Join us in Odin's forum today! 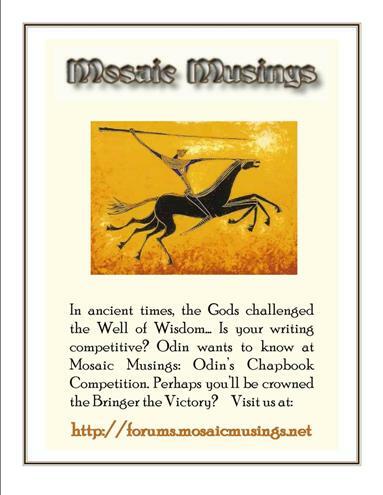 Welcome to the Mosaic Musings ‘Odin’s Opposition’ Chapbook Competition! This competition is open to all members worldwide, and requires NO entry fee. 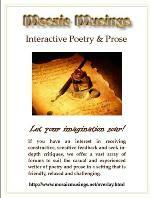 Entries can be written on any subject, in poem or prose format, and can be of any length. Entries are limited to 2 per battle. A new competition will run each quarter and will alternate between poetry and prose submissions. Once the quarter ends, all entries that have been received will be judged and winners announced. The (5) winning entries will be posted in our ‘Chapbook Competition archive’ forum, where an electronic copy of the entries will be displayed with a 1st, 2nd, 3rd and Merit designation. In addition, non-winning entries will also be archived. 1. Odin’s Opposition competitions are open to all members of our forum. 2. Entries must be the original work of the writer. 3. Previously published works are not eligible unless posted on message forums, your own website or self-published books. 4. Winning works of past ‘Odin’s Opposition’ battles are not eligible for resubmission in subsequent competitions. 5. Entries must be written and submitted in English. 6. A maximum of (2) entries per competition is permitted for members of Mosaic Musings. 7. All chapbook contracts and bookstore awards are guaranteed by Mosaic Musings, LLC. 8. A minimum of FIVE entries are required for each competition. If the minimum has not been met, those entries will be carried over to the next appropriate quarter's competition (whether for prose or poetry). 2. Content displayed on the Site is protected under U.S. Copyright laws and cannot be copied, altered, uploaded, transmitted, published, distributed, reproduced or sold, in whole or in part for any purpose other than for non-commercial and personal use. Further restrictions on the Content may depend on the Forum Participation Rules associated with the Forum in which the Content is posted. All works posted on the Site are submitted on a voluntary basis. This allows Mosaic Musings to display and archive such works within Site, and if applicable, allows members to comment on such works. All exclusive rights are reserved by the respective copyright owners and no redistribution including publication or reproduction in any form is permitted without express permission of the copyright owner. 3. Entrants allow Mosaic Musings to display and archive such works within Site, and if applicable, allow members to comment on such works (once moved into the archive forum). 4. Entrants will not post, transmit or otherwise make available any Content that is unlawful, harmful, threatening, obscene, abusive, tortuous, defamatory, libelous, hateful, or racially, ethnically or otherwise objectionable. 1st Place: Two chapbooks of winner's choice from Mosaic Musing's Bookstore and a 50% discount on one Mosaic Musings, LLC chapbook contract from our chapbook package offerings. If the winner chooses, he/she may also opt to have a sample of their chapbook displayed in Digital Web Book format on our home page (cannot exceed 50% of actual chapbook content). In addition, an electronic display with award graphic will be posted on the Mosaic Musings forum board. 2nd Place: Two chapbooks of winner's choice from Mosaic Musing's Bookstore and a 25% discount on one Mosaic Musings, LLC chapbook contract. In addition, an electronic display with award graphic will be posted on the Mosaic Musings forum board. 3rd Place: One chapbook of winner's choice from Mosaic Musing's Bookstore and a 10% discount on one Mosaic Musings, LLC chapbook contract. In addition, an electronic display with award graphic will be posted on the Mosaic Musings forum board. Merit: (2) winners - One chapbook of winner's choice from Mosaic Musing's Bookstore. In addition, an electronic display with award graphic will be posted on the Mosaic Musings forum board. There is no expiration date for the winner's chapbook contracts to be redeemed. 1. There is NO entry fee for this competition. 2. All online entries must contain a title, author's name and content. 3. Your entry will be posted as soon as you submit it in the forum. 5. There is a maximum of (2) entries per competition per member. 6. 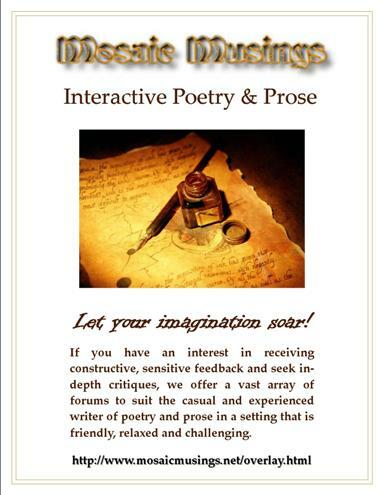 For the November through January and May through July quarters, only POETRY entries will be accepted. For the February through April and August through October quarters, only PROSE entries will be accepted. 7. Entries will not be returned. 8. If any entries are missing information, we will make every attempt to contact the entrant, but if unsuccessful, the entry will be disqualified. 9. All entries, once posted, are final and cannot be revised in the competition forum. 10. 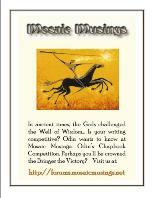 To post your entry, Go to: Mosaic Musings » Mount Olympus Challenges and Competitions » Chapbook Competition -> Odin’s Opposition and post your entry as a ‘New Topic’. 11. All entries to ‘Odin’s Opposition’ will be READ ONLY (until they are moved into the archive). 12. Entries may be any length. 1. Entries will be accessible by members only real time, whenever possible. With the exception of mail entries, on the last day of each quarter's end date, the competition will close for judging. 2. Any entries placed during this transition will be deleted and a message sent to the submitter. 3. The two poetry quarterlies will close on January 31st and July 31st. The two prose quarterlies will close on April 30th and October 31st. 1. Each competition is judged by a rotation of Mosaic Musings members who have not entered the competition. In addition, we may, from time to time, seek the input from guest judges who are highly recommended. 2. There will be a minimum of five judges per competition. We will maintain an odd number of judges for voting purposes. 3. Each judge will carefully read the entries submitted and select their top five, taking into consideration artistic quality, uniqueness, content, structure and interpretation. 4. Once each judge has chosen his/her top five entries, they will be given a points rating - 5 points for 1st place, 4 for 2nd, 3 for 3rd, 2 for 4th and 1 for 5th. The results will then be PM'd to the adjudicator, Imhotep (Peter Clark), or another designee who is not in the competition or a judge. 5. The adjudicator will enter the points onto a spreadsheet and then post an announcement listing the winner, 2nd, 3rd place and the 2 merits on the relevant thread on MM. 6. In the event of a tie, a tie-break will take place between the tied poems/stories. Judges will submit their votes to the adjudicator, giving 2 points for 1st place and 1 point for 2nd. The adjudicator will then post a revised announcement listing the winner, 2nd and 3rd place and the 2 merits on the relevant thread on MM. 7. All decisions of the judges are final. 8. Judging will take place within 30 days following the closing of the contest. 9. Please allow an additional 14 days for the announced winners to be notified. 1. All prize winners will be notified by PM, email and/or postal mail. 2. The top five winning entries will be posted on the Mosaic Musings site in the archive forum, > Archives ~ Older Works and Challenge Responses > ARCHIVES -> Chapbook Competitions with the winning desingation in the topic desctiptions and will include the designated award graphic. 3. Non-winners will not be notified of competition results. 4. Non-winning entries will be archived in the same archive forum as noted above. We, at Mosaic Musings, strive to bring out the best in our members. If you seek a free chapbook competition, we offer four throughout the year, but you must be a member to participate. We also offer member challenges in ‘The Acropolis’ and 'Pandora's Box' forums as well as practice forums. Can we initiate your intellection by expression? Thank you for visiting! Please come again. I've added the two free chapbooks and changed the digital web book prize. Since no one is taking advantage of that aspect of the 1st place prize offerings, I've decided to change the DWB to a 'sample only' of their paper chapbook instead should the winner choose to opt in.